During Ignite 2017 Microsoft announced Hub Sites. Just to recap Hub sites provides following capabilities. Today Microsoft announced that they are starting to roll-out the hub sites. Here is the screen shot from Microsoft Official blog post about this event. First question that comes to mind is how do I use Hub sites with my existing SharePoint sites. Currently you can convert existing communication site or modern team time into a hub site. Microsoft’s recommendation is to select (either existing or new) communication site as the hub site. Once a hub site is created, approved site owners can associate existing team sites and communication sites with the hub site. You will need to use Register-SPOHubSite PowerShell CMDLETS to enable the Hub Site. 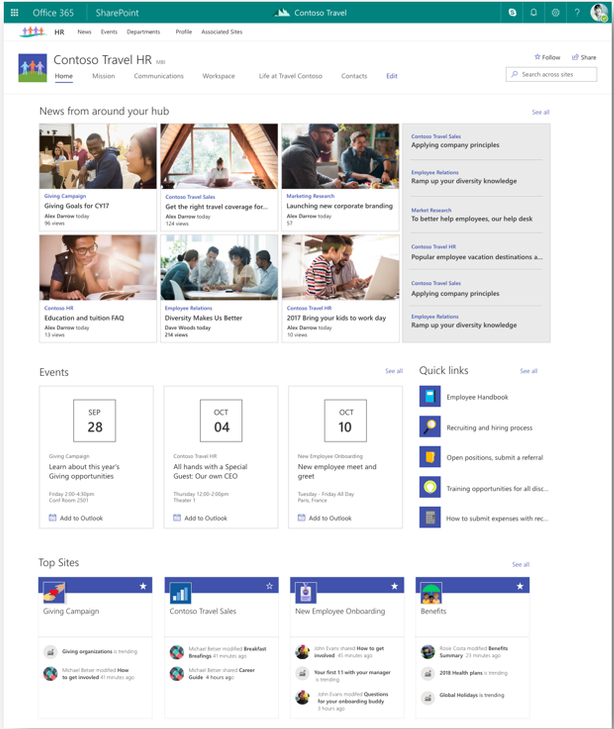 You must be a SharePoint administrator or above in Office 365 to create SharePoint hub sites. Site owners can associate a SharePoint site with a hub site that already exists. There is Ask Me Anything Hub Sites happening and I encourage everyone to join and ask any questions that you may have. This is pretty exciting announcement as first release tenants will have Hub Sites available in next month or so. If you are using OneDrive for Business then today is a good day. Today Microsoft announced Files Restore for our OneDrive for Business customers. 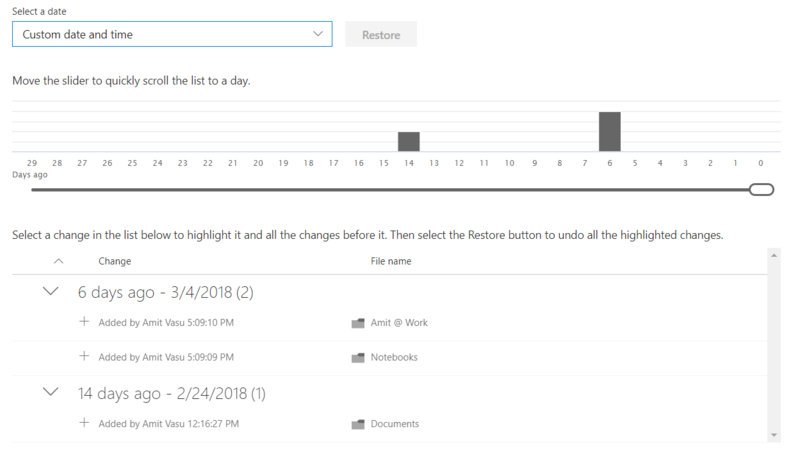 Files Restore is a self-service recovery solution that allows administrators and end users to restore files from any point in time during the last 30 days. If a user suspects their files have been compromised, they can investigate file changes and allow content owners to go back in time to any second in the last 30 days. This is huge since it gives users flexibility to revert their OneDrive to previous known stable state. To user File Restore functionality follow the steps below. Sign-in to your Office 365 ad go to OneDrive. Click on Settings and click Restore your OneDrive. One the restore page you will get a dropdown where you can either select predefined date range or select to enter your own custom date. When you select the custom date and time you will see the 30 day history and then you can select your custom date and time to restore the data. Stephen Rose has a great blog post on this. You can read more about this at the URL below. Microsoft Flow is a service that helps you create automated workflows between your apps and services. This could mean getting the approval process in SharePoint automated or automating certain tasks based on some triggers. Microsoft Flow is awesome and I would say that everyone using Office 365 should consider using Microsoft Flow to automate tasks. When working with SharePoint Flow offer various actions and triggers. I will cover some of these in future but today I am going to talk about couple of challenges when working with Microsoft Flow and SharePoint. If you are using SharePoint “Update Item” or “Create Item” action you would notice that currently (as of writing this blog post) they do not support picture column. I hope this gets fixed in near future. Another interesting challenge I ran into was the Hyperlink column. Now Flow does support Hyperlink column but not 100%. Let me explain what I mean. 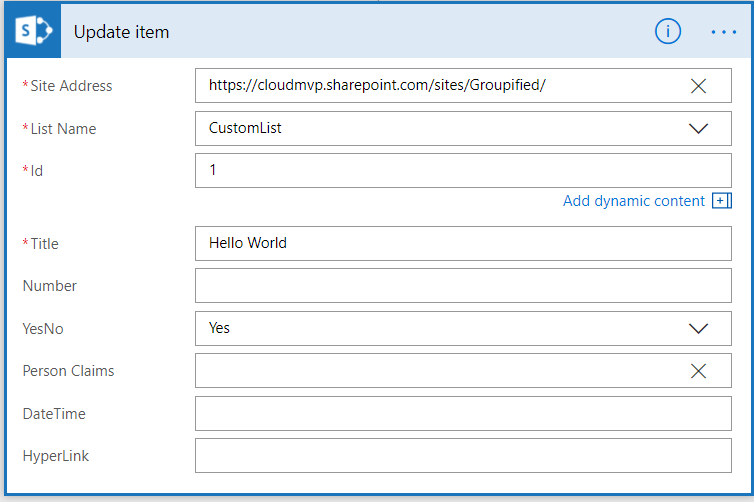 When using Hyperlink column in SharePoint, you can enter the URL as well as the Description of that URL e.g. my URL value would be http://www.microsoft.com but my description can be just Microsoft. This helps me not showing long URLs to the users. When working with Microsoft Flow Hyperlink column only accepts the URL part. Currently there is no support for entering the description for that URL. This could be bit annoying depending on your situation. Currently if you “Get Item” and update the HyperLink column using the Get Item context fields it would still not keep the description. You would end up losing the description when using Update Item action. I hope this gets resolved soon as it is very important for services like MS Flow to catch up with SharePoint list columns. Until then you can use some workaround where you can have the URL and Description in different columns and then using the column formatting to rescue you. I know not the best option but until it gets fixed you can use that option. If you have been using OneDrive for business then you should know that OneDrive behind the scene is SharePoint site collection which only users have access. For example I will be the Site Collection Admin on my OneDrive and no one can access my OneDrive unless I decide to share document or folder sitting in my OneDrive. This is perfectly fine as long as user is active. What if user left the organization and you would want to get access. Once the user leaves the organization OneDrive is smart enough to give access of that OneDrive to user’s manager and gives them about two weeks to take any backup etc. In other scenarios where user is active but running into some issues like lost files etc. In both of the above cases you have another option to get user’s OneDrive as long as you are SharePoint Administrator on your tenant. Visit the SharePoint admin center using the URL https://tenant-admin.sharepoint.com/ (Replace tenant with your tenant name). Click on User Profiles and then click Manage User Profiles. Find the user and click “Manage Site Collection Owners” for that user using the dropdown menu. This would open the popup dialog where you would user is set as Primary Site Collection Owner as well as Site Collection Owner. You can simply add the backup person’s name under Site Collection Owner and click OK.
Now I have validated the above steps works just fine as long as user is active but in some cases when user is disabled the above steps does not work. It will let you add the Site Collection Owner but that change will not take place. In that case you can user the following PowerShell to work around this issue.